You may have already noticed some changes in your Gmail. Things like a floating header – the section at the top that sticks as you scroll down through your inbox, and has tabs such as “Archive”, “Spam”, “Delete”. Another cool addition to Gmail that I’ve noticed is the profile box that appears in the upper right hand corner as you are viewing an email. The profile box attempts to give you as much information as possible about the author of the email you currently have open. There are rumors out there that a complete overhaul to Gmail is coming in the very near future. 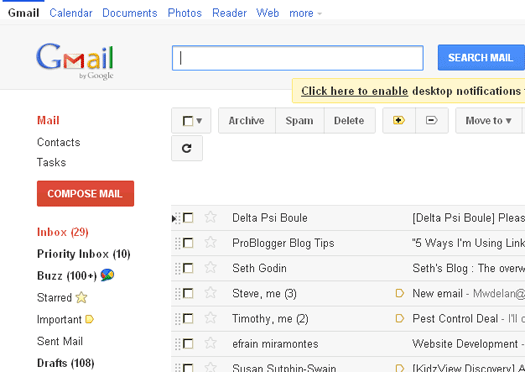 But right now you can supposedly get a glance at what’s to come by simply enabling a couple of new Gmail themes. Try this – when logged into Gmail, go to your “mail settings” > themes. Now find and enable the themes called “Preview” and “Preview Dense”. These are, according to some sources, a snapshot of the new Gmail updates that are coming. Just switched to Preview Condensed. There’s definitely a lot of white space, and it’s clean looking, but a bit hard to differentiate between the lines and categories, but that may just take some getting used to. Thanks for this info.